Here is another of K&L’s exclusives for 2014. This is another cask strength bottle from Signatory wearing the livery of their 46% UCF series. This is from Glenburgie, a workhorse distillery from the Speyside that produces malt for Chivas Bros.’s blends, in particular for Ballantine’s. It’s a distillery that flies under the radar but their malt can be very good indeed. 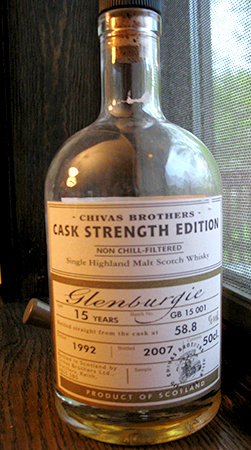 In fact, one of the malts that spurred me to further exploration of releases off the beaten track was a 500 ml bottle of Glenburgie from Chivas Bros.’ Cask Strength Edition series. That was a 15 yo, 1992 that I reviewed not too long after starting the blog and I already know that this one is not quite in that class: I opened it for one of my local group’s tastings a couple of months ago. That’s not to say it’s not good, however; we all liked it a lot. In fact, at the time I liked it more than the Signatory/K&L Glen Ord 17 that was released at the same time—and that one improved by the time I got around to reviewing it. Will the same be true of this one? I hope so. Glenburgie is one of Chivas Bros.’ workhorse distilleries, and not very much is available officially as a single malt (most of the spirit goes into blends like Ballantine’s). This bottle is part of a 500 ml cask strength series that was initially available only at the group’s distilleries, but has since come to retail in the UK. This is the only one I’ve had from that series–I’m told most everything released in it has been good–and is one of a very small handful of Glenburgies I’ve had. I have, therefore, nothing of interest to tell anyone about the series, the distillery or the general character of the malt. And so, let’s get right to it.